Thanks to Mark Hancock, I've gotten a few additional Catamounts up on the website. Both of these were from 1967, and both were numbered "Volume 11 No. 15"! One was a "special election edition" dated May 1, 1967, and the second was a regular edition dated "May 15, 1967". Mark's quite a scholar on the events of our high school and kept lots of notes and files. I just had a little pile of Catamounts, mostly ones with photos I took, which have lived in various piles and boxes since I graduated almost 40 years ago. It's funny, there was apparently a gap with No. 11, and then two No. 15s. Maybe the two "15s" was to correct for the missing "11"... not sure. We probably will never know (or care). Mark's also sent me one other from a later school year. I'll try to get to it soon. Thanks, Mark! I told my wife this story the other day, and it's kind of fun. When I was about 8 or 9 (late 50s), I heard "stereo" for the first time. We were visiting Dr. Jerry (Gerry? / Gerald?) Monroe in Dallas. He was a bigwig in R&D at Chance Vought, I think my dad worked with or for him. Anyway, my Dad had told me that he had this great hifi that had two speakers and two channels ("one for each ear, sort of") that I really should hear. I remember he had two speaker enclosures with arrays of small speakers, all the same size... I believe they were about 5-inch round speakers, and that they had blue cones - and I think gold middles. I think they were in 5x4 arrays on each side or something like that. I'd never seen anything like that, and they looked pretty formidable. I believe he had built the enclosures himself. He had his turntable, amps, and controls near the back of the room on the left hand side as you came in. The speakers were at the far end of the room. I was told to go sit in the exact middle between the speakers, and they put on some classical piece. My first impression was that the sound was not coming from the speakers at all, but in front of me... but I walked around the room to convince myself the speakers were actually delivering the sound. Someone told me that I could hear where the instruments in the orchestra were if I listened carefully, and gradually I started to pick them out a little bit. The sound was wonderful, but the funny part of the story was the next part. First I have to back up to when I was a lot younger and had my own little tabletop phonograph with my "kiddie" 78RPM records ("Winnie the Pooh", and the like). I had discovered that I could hear the records (not very well) if I used my fingernail while the turntable was spinning. So there's a physical groove, and the sound is "etched" in the groove. I think by this time in my life, I had seen sound represented on an oscilloscope, so I had some idea about frequencies and such. Also, a few years prior, my grandmother had bought us a non-stereo "hifi" that sounded *so* much better than my tabletop phonograph, that I understood a little about sound quality. I remember hearing "stuff" in the nutcracker when we first got the "hifi" that I had never heard before, and listening to it over-and-over. (These were 33 1/3 RPM records, of course). Well, anyway, at Dr. Monroe's, there were obviously two sets of speakers, and obviously "different stuff" was coming out of each side... so I figured the turntable would be somehow significantly different - there should be either two records, or two needles, or two somethings. (going back to my fingernail analogy). When I looked at the turntable, I saw only one record, one needle... so I was feeling a bit confused. So I asked Dr. Monroe the question (more or less)... how can you have only one needle putting out different parts of the music into each speaker?" I may have asked something like "Don't you need two needles?". I remember the answer... first of all, he got kind of a startled look on his face (I was only 8 or 9)... and he took a while to answer. I think he may have asked my dad "How am I going to explain this?" But he gave it a go... He said something along the lines of "Well... this isn't exactly how it works, but it's close." (I thought it was cool that he set it up like this.) "Imagine that the groove has bumps at the bottom for one side of the music, and bumps along the side for the other part of the music. So when the needle moves up and down, that causes the pickup to send the signal for one channel, and when it moves from side-to-side, that is the signal for the other channel." I think he drew a picture of the cross section of the groove as he was explaining all this. I guess it's lucky they weren't doing time division multiplexing or anything like that! Analog was so intuitive. I think the actual encoding of the two channels are offset by 90 degrees, but is on a 45 degree slant or something of the sort, with two magnetic pickups, but I've never been curious enough to dig out that level of details... at age over 50 now, I'm still pretty satisfied with Dr. Monroe's "general idea". As long as I can hook up the 4 wires and have it sound OK, I'm happy. I built my first stereo (sort of) with a turntable I got a Zacks in Palo Alto. I installed it into a monster Zenith console radio I had (which had previously had a 78RPM-only turntable - in retrospect, that was probably a bad idea - the old turntable would probably have antique value today). I put a coax wire with an RCA plug on it on one side and ran it to an old blond (B&W of course!) Silvertone TV set I had. On this TV you could plug in a phonograph signal and turn a slide switch on the back of the TV chassis and - instant amplifier for the left channel. (When you turned the switch, I think it turned the picture off. I don't know how many consumers ever actually used this feature - today it strikes me as kind of odd that it was there at all, but perhaps it helped repair people isolate problems with the audio...) The right channel just ran through the old Zenith console radio. None of this was that "hifi", (the Zenith had better sound) but it was "Stereo", so at least I could play stereo records. I had put most (maybe all) of these on the ning site for people signing up for our reunion, but some who are not "eligible" for that site might like to see these as well. Also If you are from the Cubberley Class of 1969, we are planning a reunion - please register at http://cubberley69.ning.com. It will be fun to reconnect even if you can't attend. These were from the showing of "Die Welle" that (I think) Ron Jones set up to benefit a drama program. Hal Sampson and I went to San Francisco to the Jewish Community Center to see the film, and reacquainted with our classmate Phil Neel, and we had a chance to visit a bit with Ron Jones as well. Phil also showed a demo reel from his upcoming documentary on "The Third Wave" as well. Hal and I both took photos for "The Catamount" in the late 60s. It was kind of surreal running around with cameras with Hal again - we haven't done that since 1969, although we've kept in touch over the years. Hal and I were also trying to scout out some possible sites for our 40th reunion next year, and we visited the Cubberley campus as well. We visited Mitchell Park and Cubberley. 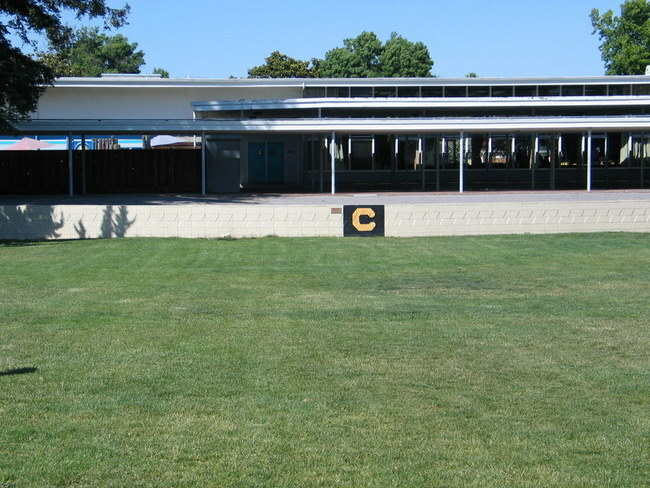 In many ways Cubberley still looks the same, even though it has not been a high school for many years. Our old darkroom (E2) and the photo classroom (E3) adjacent is now a studio for a photographer - too bad he wasn't around. Since we were going up to see "Die Welle", we went and found Mr. Jones old classroom and "Room H1" where the famous Rally occurred (although this story has grown in the telling thanks to Norman Lear and others). Fortunately there was a custodian cleaning in H1, so we got to go in and take a few shots. When we were in Cubberley, instead of the purple seats on the tiers, they had those dorky little lecture desks with a little wraparound writing panel on them. 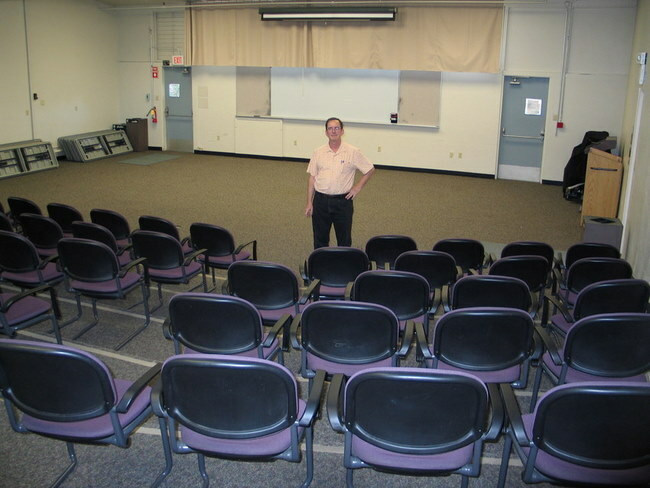 Everyone had to take Drivers Ed in H1, and Mr. Hurley was the teacher. This was where we ate lunch - had pep rallys, etc. Note that the "C" on the bricks was freshly painted - it was pretty faded at our 2004 (35th) reunion. There was a snackbar under the overhang to the right, and a cafeteria with long tables inside the building. The tables were put away and seats set up for drama, etc. In 1969, the Cubberley Theatre had not yet been built (and Dave Buck, the drama teacher was still alive). The theatre was Dave's dream, and it finally came to pass. 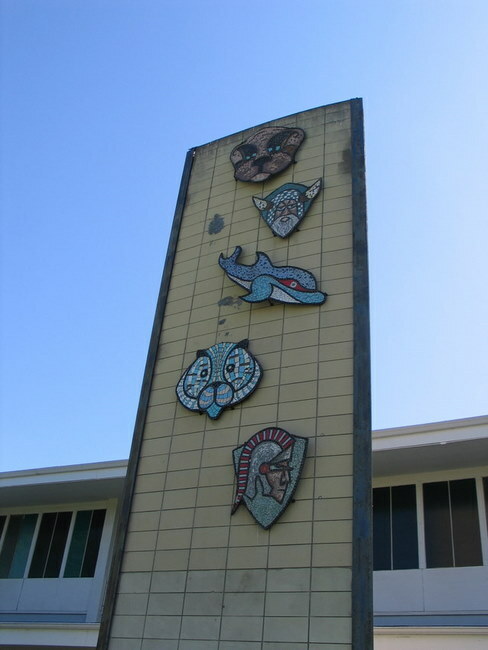 The old "Totem" in the Courtyard where everyone ate lunch, had rallys, etc. 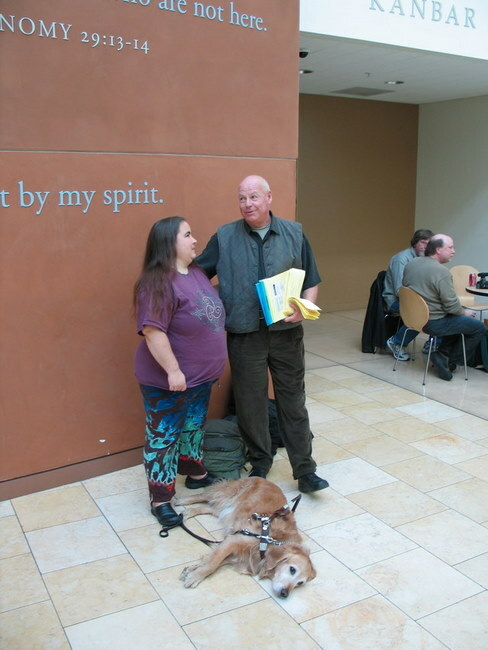 Ron Jones and friend with guide dog at Jewish Community Center in San Francisco prior to showing of "Die Welle"
Q&A session following showing of "Die Welle"
...from the video camera position. A few things Cubberley-related have come to my attention, so I thought I would at least make a few comments and provide some links. 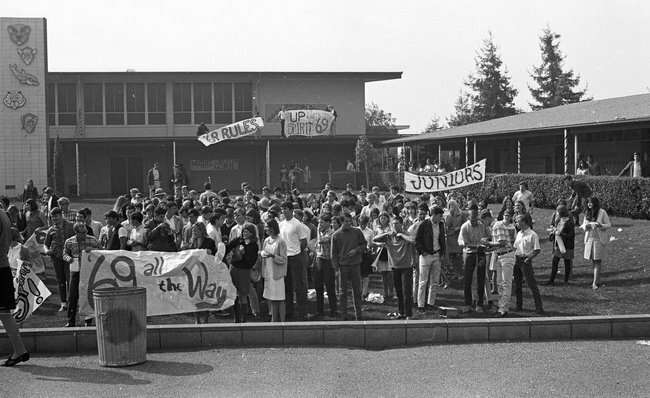 The Cubberley class of 68 is about to have their 40th reunion in August (http://www.cubberley68.com/). My class (69) also has a site to start planning the reunion (and a pretty good online reunion is starting to happen as well) at http://cubberley69.ning.com . Yet another film based on Ron Jones and "The Third Wave" released in Germany - it's called "Die Welle". You can find the trailer on youtube (or at http://www.welle.info/). It's not showing in general release in the US< but is very big in Europe. When a special showing came about in May, Hal Sampson and I went to SF to see it. It was held at the Jewish Community Center as a special benefit for a drama program. I believe that Ron Jones had been instrumental in setting up the benefit. 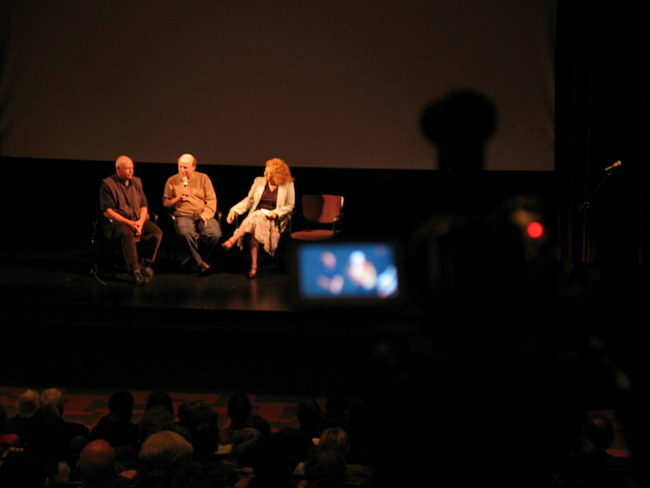 Phil Neel (Cubberley 69) and his TV crew were there to record the question-and-answer session following the film. Phil also showed a demo reel for his upcoming documentary on "The Third Wave". It was fun to reacquaint with Phil and to see Ron again. 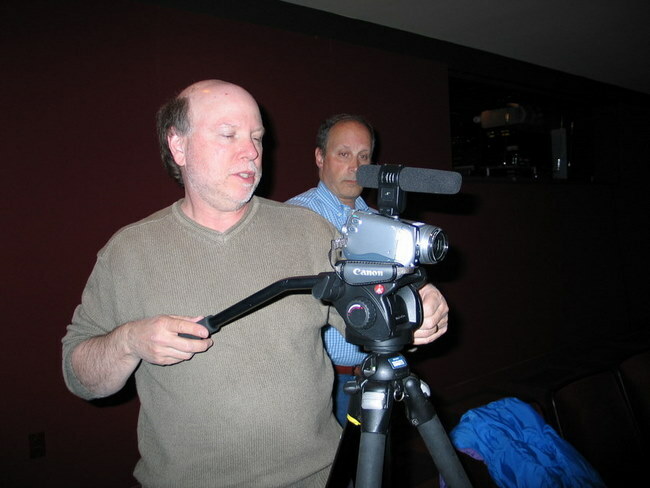 Phil even had an extra camcorder he let me run for the Q&A. Running around with Hal and a camera was some sort of Deja Vu. It was fun to see Alyssa Hess (Reit) in the demo reel. I remember Alyssa from many of my classes, and that she played the harp. I used to look forward to assemblies when she played the harp - I've always loved that sound since I first heard it in Swan Lake in kindergarten. Alyssa has at least one album out where she is featured, plus several MP3s available on Amazon. 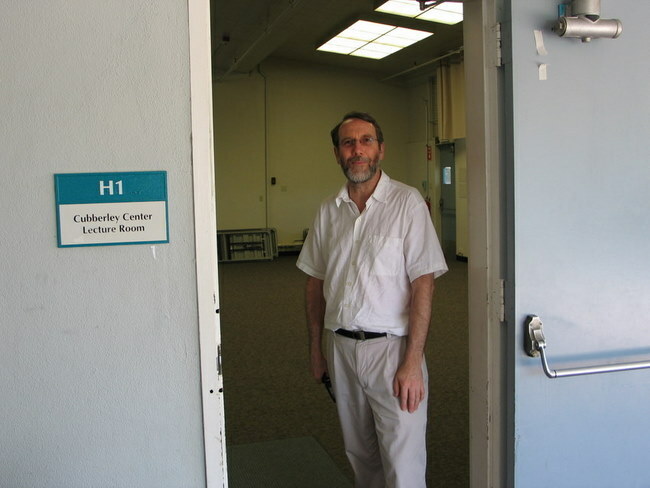 Earlier the same day Hal and I ran around Palo Alto to Mitchell Park and Cubberley to visit old haunts, and we took a few snaps of the original locations where the Third Wave took place - room C3 (Ron Jones' classroom in 1967) and H1 (the lecture hall where the rally was held - remember Drivers Ed' with Mr. Hurley?). I finished scanning all of the Catamounts I have for 1968 and 1969. Rereading them was an interesting saga that I hope some of you enjoy as well. I'm afraid I got into a hurry and didn't catalog every detail as well as I should have. If there were photos, I tried to put a note on the catalog page with the person's name - also if there was a story *about* someone. I couldn't list all the members of large groups, though. I hope the search engines can pick those up in the PDFs.